Please use this topic to discuss the phpBB Numerology series of blog posts. This will be a 5-part series of blog posts providing some statistical data about the way users download extensions from phpBB.com. The first of the blog posts, phpBB Numerology – Extensions (Part 1) is now up. There is a typo in "dmxx". phpBB Numerology – MODs (Part 2) is now available. Lot of "oldies but goodies" on this one! I don't understand why I'm not number 1 in all categories. phpBB Numerology – Language packs (Part 3) is now published. I'm not sure if the current numerology is really correct in a overall term, because some local support sides (eg. german and french, and may be many others) provide localized phpBB-Versions, so there is in that case no need to download a language pack from phpbb.com. canonknipser wrote: I'm not sure if the current numerology is really correct in a overall term, because some local support sides (eg. german and french, and may be many others) provide localized phpBB-Versions, so there is in that case no need to download a language pack from phpbb.com. That's fine and dandy but we do not endorse that at all. The only place officially endorsed by us for language pack downloads is the language pack downloads section of our site. Those have actual oversight, validation and individual maintainers. Users downloading language packs from other places do so at their own risk. It's a pity that none of my extensions are in the list. UE and QR have been firstly validated in 2016, but it just took years for making them compatible with the CDB standards. They received more than 3k and 1k downloads respectively this year, but they were submitted earlier. That's why they're not in the statistics 'submitted in 2016'. I suppose that most downloads of my extensions come from GitHub (for many reasons), maybe I should re-think the main source because of that kind of statistics. At least I'm glad for the language package at the first place. LavIgor wrote: It's a pity that none of my extensions are in the list. Just wanted to say that I love QR (looking forward to quicknick ). I think it should remain available on all channels. Part 4 - phpBB Numerology – All customisation downloads is now live. 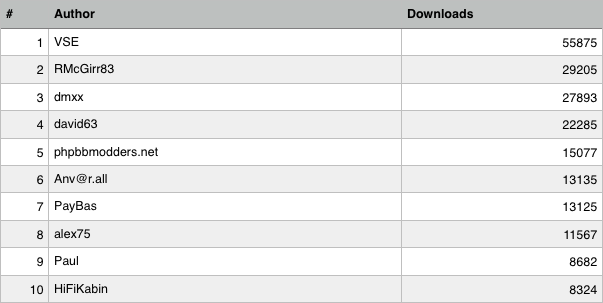 As most would expect, MODs reign supreme in downloads, at least for now. yet your upload extensions extension is the best one out there imo! Also part 5 will be styles I hope? I really want it to be styles.